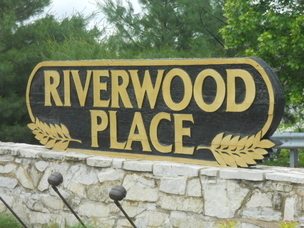 Riverwood Place, a residential community in Hazelwood, Missouri, is located near the main cross streets of Howdershell Blvd. and Riverwood Trails Drive, just a few miles north of I-270 and McDonnell Blvd. Situated around a lake teeming with fish, and surrounded by stands of mature trees, the neighborhood is home to nearly 500 residential and condominium property owners. The residences include two-story and one-level ranch style homes as well as multi-level condominiums. Amenities shared by residents include a clubhouse, common grounds, bike paths, pool, tennis court and weight room. The community boasts paved walking paths and hiking trails. Riverwood Place adjoins Truman Park and the 812-acre St. Stanislaus Conservation Area on the Missouri River.